Due October 19, the 4LP package presents the debut solo records by Paul Stanley, Ace Frehley, Gene Simmons and Peter Criss. The projects were issued at the height of the group’s success in the 1970s – following 1977’s “Love Gun” – which was the last KISS album from the era to feature all four original musicians. Guitarist Frehley led the way in both album sales and singles chart success, with his cover of the 1975 Hello track, “New York Groove”, reaching No. 13 on the Billboard Hot 100. Available exclusively through the KISS webstore and The Sound Of Vinyl, “KISS: The Solo Albums - 40th Anniversary Collection” is limited to 2,500 copies worldwide. 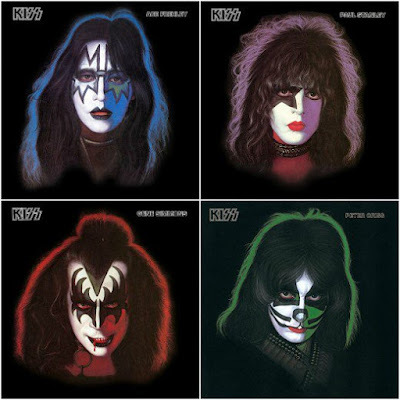 Each heavyweight 180-gram LP features a unique color to match its associated cover art, with “Paul Stanley” presented in purple vinyl, “Ace Frehley” in blue vinyl, “Gene Simmons” in red vinyl, and “Peter Criss” in green vinyl. All four albums are housed together in a deluxe black-matte slipcase that features glossy black images of the four artists' faces alongside a set of four 12-by-12-inch posters of each album cover, and an exclusive turntable slipmat that shows all four of artist Eraldo Carugati's iconic, painted album-cover face images all connected together. Frehley is among the artists scheduled to perform on KISS Kruise 8 next month, which sets sail from Miami, FL to Key West and Nassau, Bahamas with a lineup that includes Vintage Trouble, The Dead Daisies, and more.